NEW ORLEANS – As we advance through the indoor track & field season, it is time to update the race for The Bowerman for the 2019 season! 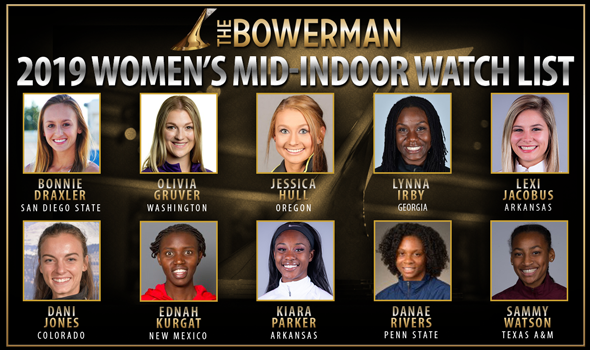 In the first update since the inaugural list in 2019, the newest Women’s Watch List for The Bowerman was released by the U.S. Track & Field and Cross Country Coaches Association (USTFCCCA) on Wednesday. Eighteen women were recognized by The Bowerman Watch Committee in total with 10 of those athletes earning enough votes to be selected as a Watch List honoree, including three selections that joined the list for the first time in their respective careers. Bonnie Draxler R-SR San Diego State Pole Vault/Sprints Wrightstown, Wis.
Olivia Gruver SR Washington Pole Vault Reisterstown, Md. Lynna Irby SO Georgia Sprints Indianapolis, Ind. Lexi Jacobus SR Arkansas Pole Vault Cabot, Ark. Dani Jones SR Colorado Distance Phoenix, Ariz.
Kiara Parker SR Arkansas Sprints Waldorf, Md. Danae Rivers JR Penn State Distance Derby, Conn.
Sammy Watson SO Texas A&M Mid-Distance Rochester, N.Y. First-time members of the Watch List include Bonnie Draxler, Kiara Parker and Danae Rivers. Rivers is the first woman from Penn State to make the list in program history while Draxler is just the second San Diego State athlete to earn the honor. Parker is Arkansas’ sixth Women’s Watch List honoree in program history and the first Razorback sprinter to appear since Regina George in 2013. Parker leads the nation in the 60 (7.15) and is 12th overall in the 200 (23.26). Draxler is tops in the country in the pole vault (4.52m/14-10) and Rivers is second overall in the 800 (2:02.94). Now that the newcomers have been introduced, it’s time bring up the returners. Olivia Gruver has yet to compete this indoor season. She is last year’s national champion in the outdoor pole vault and placed third at the NCAA Indoor Championships. Jessica Hull has only competed in one indoor meet so far this year and slotted herself with the No. 1 mile in the country (4:31.03). Last year’s outdoor 1500 national champion also competed in the 3000 and DMR at the indoor national championships, so more strong performances are sure to be on the way. Ednah Kurgat has only raced at one meet so far this indoor season as well, but she made it count. Kurgat currently has the top time in the nation in the 5000 at 15:14.78, which is also the third fastest time in collegiate indoor history. Dani Jones has yet to compete this indoor season. Jones is another athlete who competed in multiple events at the NCAA Indoor Championships last year, so she’ll be ready to go soon. And while she has competed in a few more meets than the previously listed athletes, Sammy Watson has only ran her signature 800 event once so far this season. Her time currently sits 14th in the country at 2:06.52. She has a personal best in the event of 2:02.20, set at last year’s NCAA West Preliminary Round. Lynna Irby has only competed in two meets so far as well and currently ranks 10th in the country in the 200 (23.23). She made the finals of the 200 and 400 of last year’s NCAA Indoor and Outdoor Championships. Last but certainly not least, Lexi Jacobus is ranked second overall in the pole vault at 4.51m (14-9½). She sits less than an inch behind fellow Watch List honoree Draxler, who leads the nation. Other athletes receiving votes by The Bowerman Watch List Committee, but not enough make The Bowerman Watch List, include: Chanel Brissett (USC), Payton Chadwick (Arkansas), Tamara Clark (Alabama), Maria-Josee Ebwea-Bile (Kentucky), Mackenzie Little (Stanford), Allie Ostrander (Boise State), Kaelin Roberts (USC) and Twanisha Terry (USC). The next Watch List will be released on February 27.